The basic tools of yoga include postures, breathing, contemplation, and meditation. 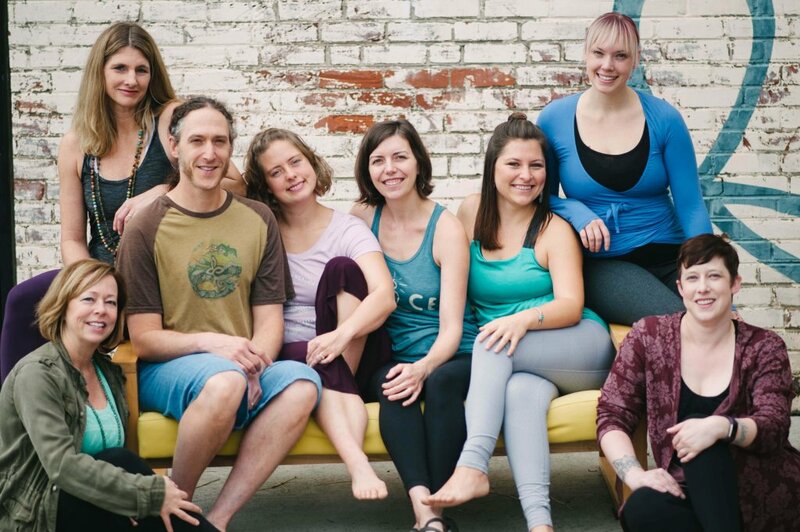 Our classes are unique blends of these techniques, designed by passionate and skilled yoga instructors. Each teacher will bring their own experience to their teaching, and modify based on the students who attend. Break it down, build it up. Alignment Yoga provides specific instruction on forms of postures and breathing. Classes may include periods of flowing movement, but the primary aim is to help you refine technique and understand the mechanics and purposes of poses. Mildly to moderately challenging. Body Love Yoga is for those with limited mobility or abundant bodies. Approachable sequences are taught slowly, to allow for transition between poses. Learn to adapt poses for your body, so you can create a cease fire zone for negative thoughts on your mat. You may leave class not only feeling better in your body, but better about your body too! Gentle to mildly challenging. Mysore style is named for the South Indian city where the Ashtanga Vinyasa sequences originated, under the direction of Sri K. Pattahbi Jois. Different from other group classes, you practice the same poses in the same order each time. Mysore is self led, with an experienced teacher present to introduce you to the sequence, and to provide support individually. Each student learns the sequence at his or her own pace. No prior experience with Mysore is necessary. Read More. Challenging. Focused, dynamic floor exercises and use of free weights will help you develop strength and control of instrinsic core muscles. Moderately to significantly challenging. Get moving. Expect to sweat. Power Flow is intended to develop strength and focus, layered with breath control. Practice will be rigorous, and arm balances and inversions are often included. Expect minimal breaks during the course of practice, but relaxation will be included at the end of class. Moderately to significantly challenging. Restorative Yoga teaches body and mind to slow down, relax, and rest. Designed to restore the nervous system and facilitate release of deeply held tension, this class uses props to fully support the body in all poses. Poses are held for 5-15 minutes using no muscular effort. A meditative focus is offered in each class. Gentle. The ropes wall is a unique feature of our studio. Explore the potential for increased movement, and realize muscular imbalances, as the leverage and traction the ropes provide help you maintain proper form. Beginners to advanced students will find benefit, but this class is not recommended for absolute yoga beginners. Class is limited to 12 students. Mildly to moderately challenging. Take your time. Move with intention. Slow Flow is designed to build control, coupled with breath awareness and mindfulness. Expect flowing transitions from pose to pose, but the pace will be slow and steady, with breaks as needed for instruction or rest. Mildly to moderately challenging. A wheel-shaped prop is central to this class, and is used to address tension and muscular restriction, as well build core stability. Class is limited to 12 students – unless you bring your own wheel. Beginners to advanced students will find benefit, but this class is not recommended for absolute yoga beginners. Mildly to moderately challenging. Yin postures are primarily on the floor and held with little to no muscular effort for 2 to 5 minutes each. The yin postures focus on the hips, pelvis, lower back, and knees, helping the body to remain supple at its core. Since Yin Yoga postures gently stretch and rehabilitate the connective tissues that support our joints, it is the perfect compliment to Yang activity (vigourous yoga, running, weight training, etc.) Gentle. The first part of this class uses Yin Yoga to create space and integrity in both our joints and our minds. The latter part of the class includes flowing repetition of movements, which develop strength and balance, and breath work to facilitate heat generation and deep internal awareness. Moderately challenging. Begin. Or begin again! The basics are never boring when you are open to learning new things. Perfect for absolute beginners to experienced practitioners with a beginner’s mind. Mildly to moderately challenging. Slow Flow with extra consideration for changes that come with aging, such as balance and joint health. Mildly to moderately challenging.